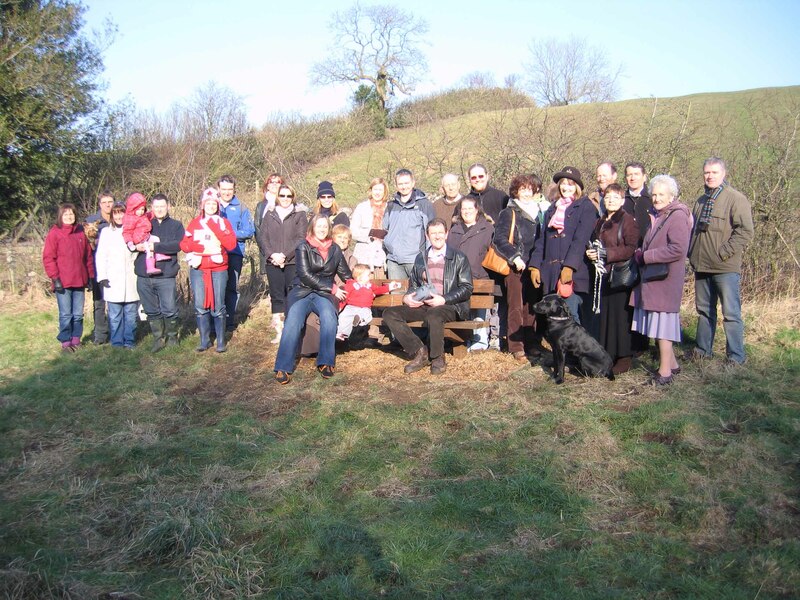 On the afternoon of Sunday 17th February 2008, 27 Team Graeme friends plus three children and two dogs went along to Guisborough Forest and Walkway to plant some trees and install a bench in memory of Graeme. 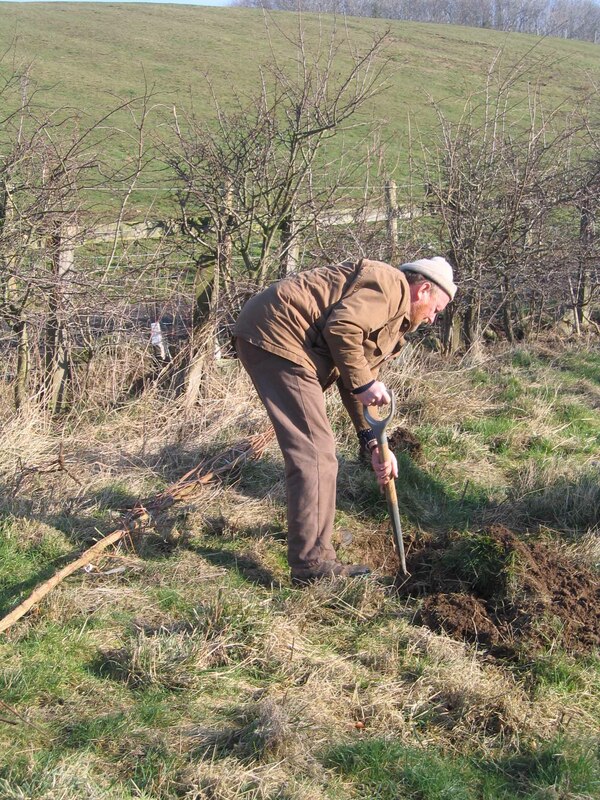 The trees were planted around the area shown on the photograph below that was kindly supplied by Alan Ralph. I think it must have been taken by Ellen since Alan was busy digging and planting one of the trees. This is near Guisborough in North Yorkshire and the location of the Forest Walkway can be seen on a map by clicking here. The entrance to the site is just off the A171 from Middlesbrough to Guisborough. Driving along the A171 towards Guisborough go past The Cross Keys Pub on your left and at the roundabout turn right onto the A173. The entrance to the walkway is about 300 yards along the A173 on the left hand side. Go past the first road on the left and there is a brown signpost on the side of the road which leads to the car park. There is quite a large car parking area and behind it you can see the visitor's centre that you should head towards. To get to the trees and bench just walk towards the centre from the car park through a gate and turn left. Go on to the track with the centre entrance on your left. 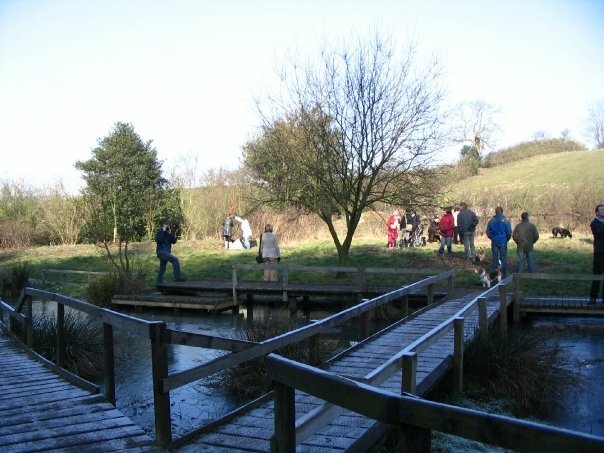 After a short walk you will come to some ponds on the left and the Team Graeme trees and bench are on the other side of the ponds. You can see the bench from the track and to get to it just go through the gate and across the board walks. The trees themselves are not specially marked but can be recognised by the stakes to which they are attached. The first two trees are on either side of the first board walk as you cross to the ponds. 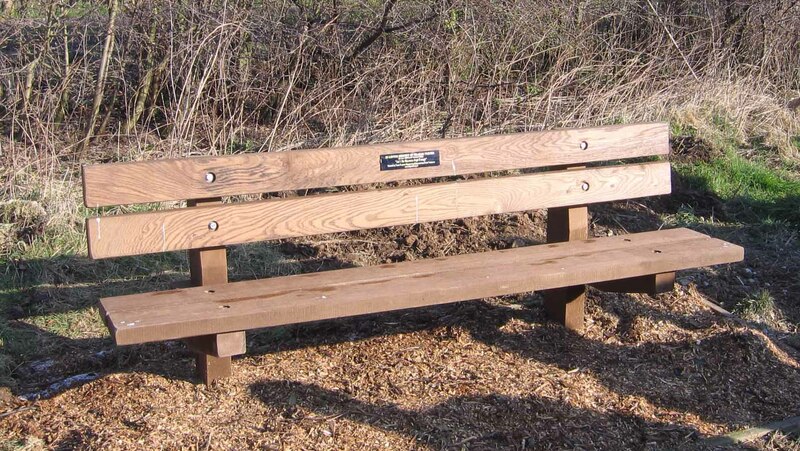 There are then another two to the left of the bench and one to the right. Please let us know if you have any difficulty finding them and I will update these directions. If any of the Walkway staff are around they should be able to direct you. Sunday was a beautiful winter's day with the sun shining brightly and not a single cloud in the sky. Those areas out of the sun were covered in frost from the previous evening so it was quite chilly but with no wind it was very still and perfect for tree planting. We could not have picked a better day for the occasion. The idea for planting the trees came originally from Jackie Wearn whom Graeme had met on his trek to Mount Kilimanjaro in 2004. This was a lovely idea but it took quite some time to find the right spot and the place we eventually chose is at the foot of the Cleveland Hills not far from Roseberry Topping. This is an area that Graeme used to go walking when training for his Kilimanjaro Trek. It is also the area that the 2008 Team Graeme Kili trekkers will probably become familiar with too as they train for their memorial trek in October 2008. After all the trees had been planted Jackie made a short speech about why she had wanted to plant a tree instead of buying flowers for Graeme's funeral. We have a video of the speech by Jackie and also of Joanna reading the poem. To see the speech that Jackie made please click here Speech and for the poem please click here Poem. The tree planting involved not just placing a tree in a hole but actually digging the hole itself. The first thing was to get five volunteers which was easy. 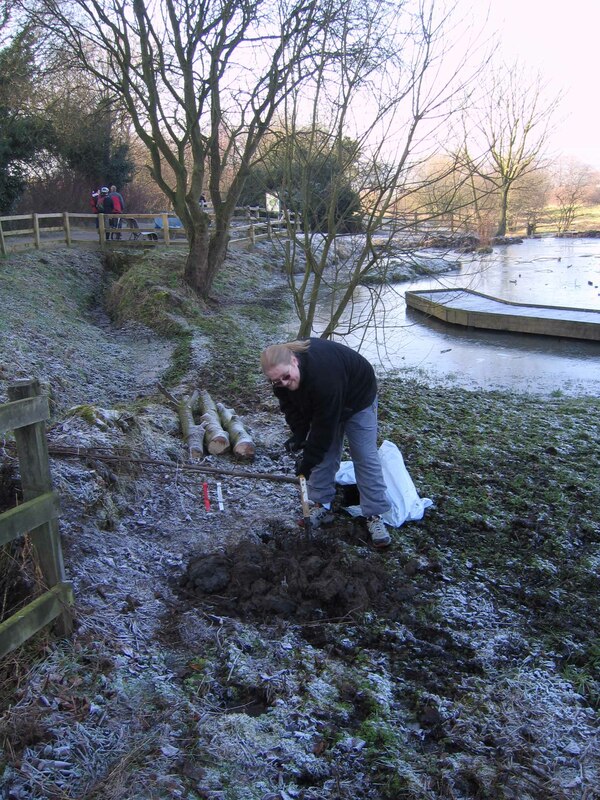 We have a short video showing the volunteers hard at work with their spades so have a look by clicking here Digging. The photos below show the five willing diggers at the places around the site. 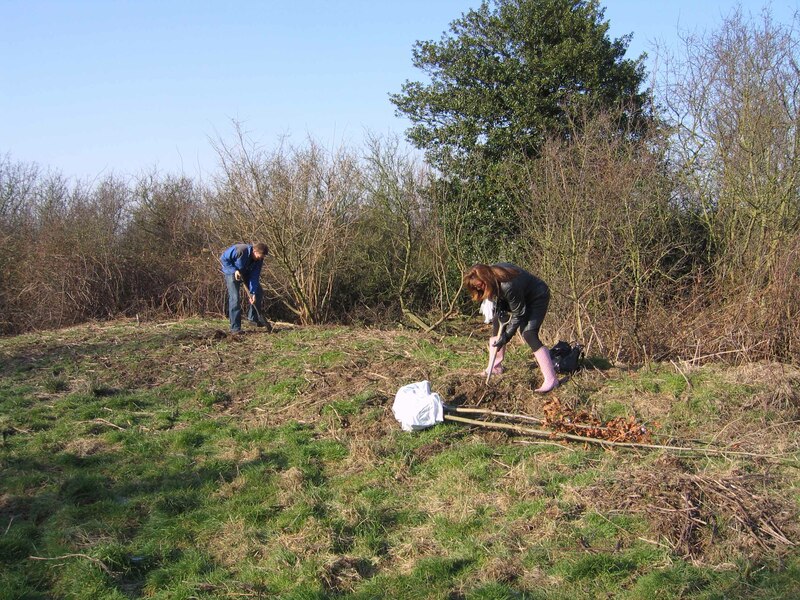 In the sunniest and warmest spots James planted an ash, Jackie an oak and Douglas a field maple. 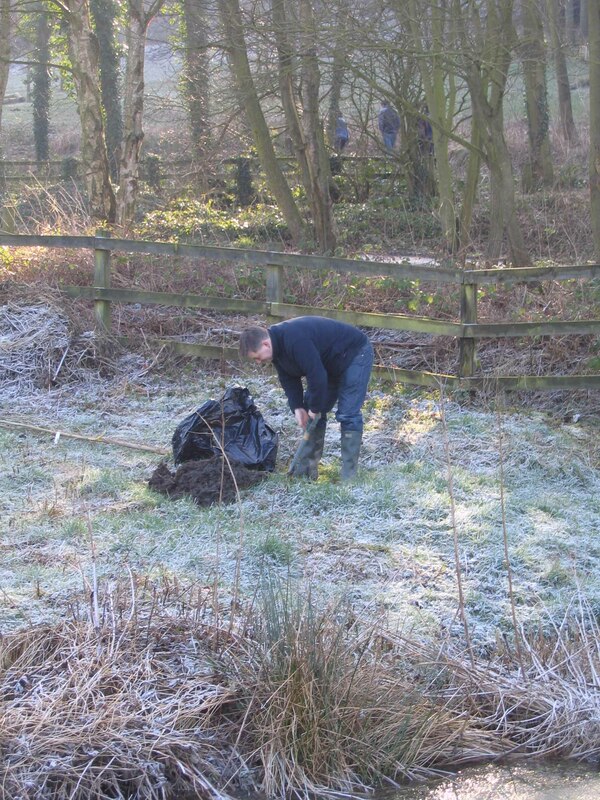 In the shaded and much colder spots Andy planted a black poplar and Alan an alder. There are a more photographs on the message board that have been taken at various times throughout the year and those taken in the summer are really lovely. The site looks very tranquil. Alan has provided a link to his facebook page where he has uploaded some photos that he took on Sunday plus others taken at the Launch Party and The Race Night. 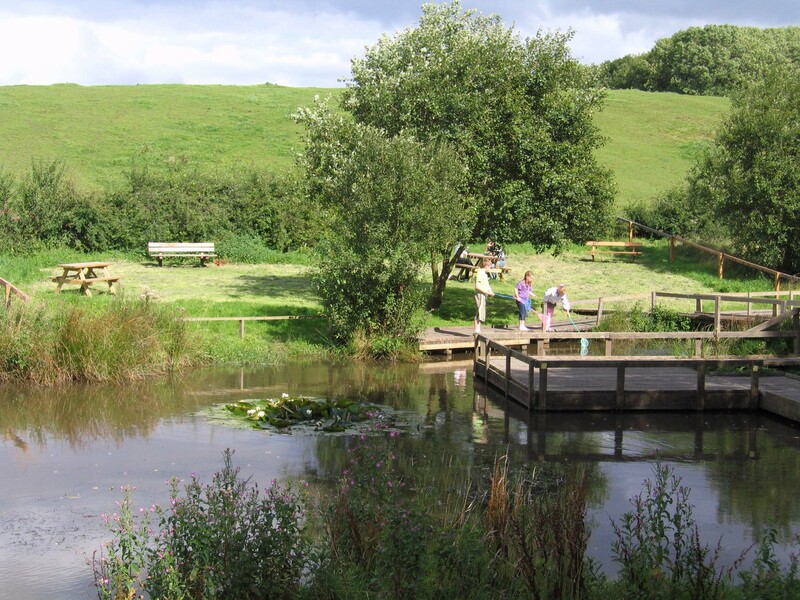 This lovely area is being developed by the Guisborough Forest staff and is already a popular place for visitors. In the area where our trees and bench are there will be some picnic tables and so in the spring and summer it will be a place where you can rest after a walk or you can just sit and contemplate things. There are several woodland walks around the area along the old railways lines and it is a starting point for treks to the top of Roseberry Topping or to Great Ayton or other picturesque parts of the Cleveland Hills. Looking to the long term we are thinking of a Team Graeme Forest of trees. Although the area for the initial planting is not large the Guisborough Forest staff have other areas that they are developing. These could be used to plant many more trees and we are hopeful that this could be a long term project. The first few trees that we are planting are called standards and are about 6 - 7 feet high so are well established. For our Team Graeme Forest idea we can plant a large number of smaller trees. For less than £10 you can get a couple of trees and make a small donation to our fund raising. Perhaps we can use this idea to contribute to the reduction in greenhouse gases by planting a few trees whenever we fly away on holiday. Please let us have your thoughts on this. 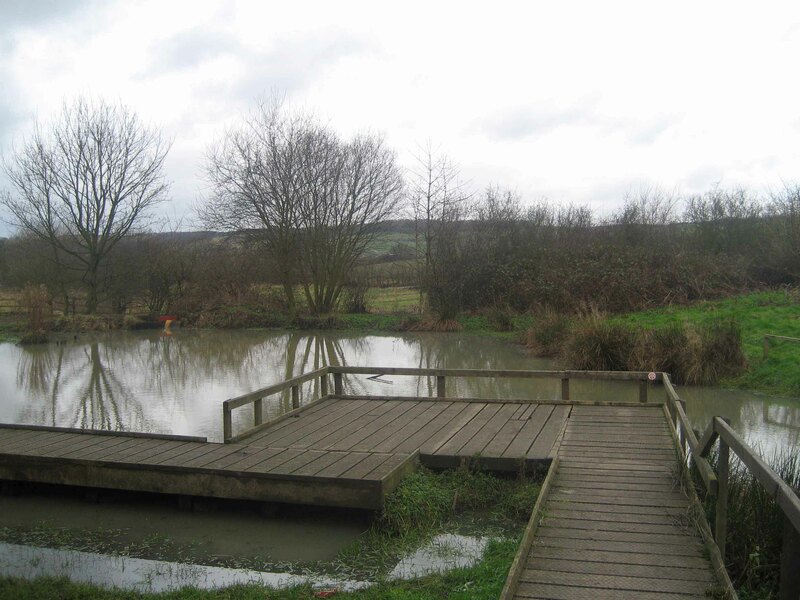 The following photo gives another view of the area next to the tree site showing the ponds with boardwalks.